There was report about a case of crossbeam tension wire breaking-off on a Combat L glider. The wire broke off in front part between two press sleeves. The possible reason is multiple bend. We ask all pilots (Combat owners) to check thoroughly the crossbeam tension wires at the points as marked on the picture. Check that the thimble moves smoothly. In case of any determined damage, even a single broken strand, immediately refer to your local dealer and replace the wire. Please check the marked points on the rigged up glider with VG on, if you see that the wire in the marked points has an accustomed sharp bend, replace it even if there is no visual damage. 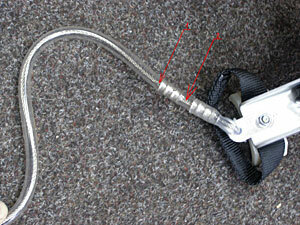 We strongly recommend moving the wire out of the ‘keel rib pocket’ with Velcro to the left side. This will make the wire lay in smooth ark when VG is on. We remind all pilots to perform a pre-flight check of your glider as well as periodic glider maintenance as recommended by the owner’s manual for your glider. Nuts and bolts must always be secured. All wires should be checked. A side wire that has been kinked one time should be replaced immediately. 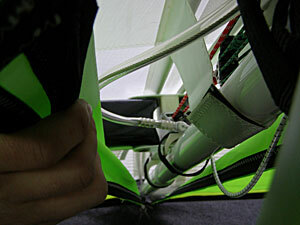 If you have questions about the need to repair or replace some parts of your glider, feel free to contact your dealer or Aeros directly. We recommend that you have all maintenance work done by your Aeros dealer.